Got Vaping Questions? We Have The Answers! It can be difficult to choose between a mechanical mod or a variable mod. Whether you’re quitting tobacco products or just want to try vaping, it’s a matter of preference. 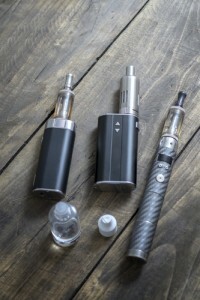 Mods are mechanical or variable when it comes to voltage/wattage. To add to the confusion, there are 3 types of rebuidables: Drippers, bottom feeds, and Genesis. As for batteries, IMRs are safer and therefore preferred. Most standard vapes use silica for the wick. Genesis vapes use stainless mesh wicks. The majority of resistant heating coil/wire is Nichrome or Kanthal. Resistance determines power, power affects volume, temperature, and flavor. Mechanical mods do not contain circuitry and are essentially hollow tubes with a switch. These are preferred for sub-ohm vaping (less than 1 ohm). Voltage/power can be adjusted with variable mods and contain a protective circuit against shorts but can’t be used for sub-ohm vaping. The 3 types of atomizers are top-feed, bottom-feed, and rebuildable dripper atomizers. Top-fed atomizers contain rolled stainless steel mesh as the wick. Silica is used as wick in most standard builds. Rebuildable mods have 2 core sections. The lower portion holds the battery and is the mod. The top is the coil and is a rebuidable atomizer with mechanical and variable voltage and wattage. Nichrome and Kanthal resistance wire is used in atomizers. Kanthal is more robust. Always torch the wire first to burn off manufacturing residue. This kind of wire is also used in heating and ventilation systems, and in small home appliances. Drippers do not have a tank and produce less problems. Simply add a few drops of e-juice onto the coil between puffs. You can also switch flavors with ease. To increase the length of the wire, wrap it. This also increases the resistance. Since resistance is power, power equals voltage square over the resistance. In a battery equaling 3 volts with a resistance of 1 ohm, the power is 9 watts. Increased resistance = reduced power. Decreased resistance = increased power. Power affects flavor, temperature and volume of vapor. You can adjust the power of the voltage in variable mods. You can also set the power to the desired wattage similar to vaping at 3.2 volts or 4.8 volts. Because mechanical mods are a hollow tube with a switch and have no circuitry or protective circuit, you can build what you desire and it will still fire. That's why mechanical mods are excellent for sub-ohm vaping. Sub-ohm vaping can be dangerous if you do not know what you are doing. Consult with an expert at your place of purchase. Variable mods won’t work with low resistance because they have a circuit to prevent shorts. They cannot be used for sub-ohm vaping. IMRs are not standard rechargeable batteries so they are considered safer. You can purchase button or flat top. The number on top is the battery capacity. The lower number is the physical size of the battery.